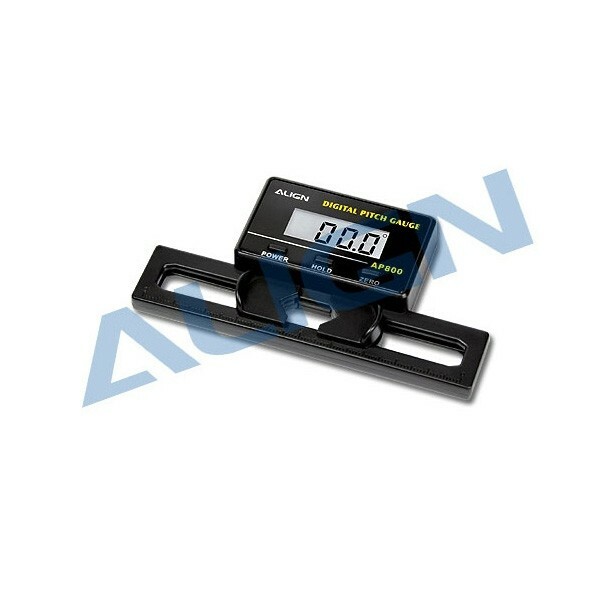 HET80001 AP800 Digital Pitch Gauge. Developed by the RD team in Align, the new AP800 digital pitch gauge is suitable for flybar and flybarless helicopters. Auto-detecting Horizontal level , with result displayed through high contrast LCD screen, providing a simple and precise way of measuring pitch angle. - Uses backlighting LCD monitor. - Zero and Lock function. - Detectable pitch range: -90 - 90 degrees. - Suitable for 200-800 mm main blades. - Build-in energy saving function. Power shuts down after 3 mins without any movement.